Why must we assess transboundary water systems? The water systems of the world — aquifers, lakes, rivers, large marine ecosystems, and open ocean — sustain the biosphere and underpin the health and socioeconomic wellbeing of the world’s population. Many of these systems are shared by two or more nations. The wellbeing and socioeconomic development of a significant part of the world’s population depends on these transboundary water systems, and the essential ecosystem goods and service they provide -- including freshwater for domestic, industrial and agricultural use; fisheries, tourism, transportation, water assimilation and climate regulation. Undeniable trends, however, indicate that a growing human population and its activities as well as a changing climate are modifying these systems at an increasing rate. What is the GEF TWAP? Recognizing the value of transboundary water systems and the fact that many of them continue to be degraded and managed in fragmented ways, the indicator-based Global Environment Facility Transboundary Waters Assessment Programme (GEF TWAP) was developed. The Programme aims to provide a baseline assessment to identify and evaluate changes in these water systems caused by human activities and natural processes, and the consequences such have on dependent human populations. At a first step, the methodologies for conducting a global assessment of the five types of transboundary water systems were developed during the TWAP Medium-sized Project (2009-2010). The TWAP Full-sized Project is currently implementing the first truly global comparative assessment for transboundary water system categories (groundwater, lakes/reservoirs, rivers, large marine ecosystems); and a thematic evaluation of the open ocean, through institutional partnerships that hope to seed future global assessment as well. The project results assist the GEF and other international organizations in setting priorities for supporting the conservation of transboundary water systems. How are the assessment conducted? The TWAP consists of five independent indicator-based assessment and the linkages between them, including their socioeconomic and governance-related features. The five water-category specific assessments cover 199 transboundary aquifers, 42 non-transboundary aquifers in small island developing states, 204 transboundary lakes and reservoirs, 286 transboundary river basins, 66 large marine ecosystems (and the Western Pacific Warm Pool), and the open ocean; a total of 756 international water systems. The assessed waters cover over 70% of the planet’s oceans and landmass, and about 16% of the planet’s landmass that is also underlain by transboundary aquifers. As a first global comparative assessment of transboundary waters (those shared by two or more countries), TWAP provides quantified assessment results that can inform the setting of priorities for intervention by GEF and others as well as the development of strategies on how nations and regions can meet their Sustainable Development Goals (SDGs) and targets by 2030. The TWAP delivers the first baseline assessment of all the planet’s transboundary water resources, providing benchmarks of the current state of water systems to inform policy, encourage knowledge exchange, identify and classify water bodies at risk and increase awareness of the importance to protect transboundary waters at relatively low risk and mitigate the states of systems at moderate to highest risk. The TWAP assessment is the first global assessment that uses quantified indicators of system states, pressures and impacts under three broad themes: biophysical, socioeconomic, and governance. Results are summarized into five relative levels of system risk - lowest, low, moderate, high, and highest - which are amenable to system and regional scale comparisons. As such, TWAP is poised to help identify core indicators to support national monitoring and reporting of targets required to realize the Sustainable Development Goals for the period 2015 – 2030. TWAP freshwater indicators map to SDG 6 on Clean Water and Sanitation, notably Target 6.6 (protection and restoration of mountains, forests, wetlands, rivers, aquifers and lakes). TWAP marine indicators support SDG 14 on Oceans, Seas and Marine Resources, and all its targets. The United Nations Environment Programme (UNEP) is the implementing agency and the strategic partnerships formalized through the TWAP are shown in section Partners. Each partner engages a broad network of experts that evaluate transboundary water systems thematically or geographically, and comparatively, within each water system category. They employ a range of tools in such efforts, including mathematical models and geographical information systems to examine basin states. The TWAP drop is divided into five different sections, representing the five interlinked transboundary water systems: groundwater, lake/reservoir basins, river basins, large marine ecosystems and the open ocean. The crossing lines within the drop symbol represent the boundaries of these water systems that do not respect political borders and extend across national boundaries. The assessment results are organized into five technical reports and a sixth volume that provides a cross-category analysis of status and trends. A Summary for Policy Makers (SPM) accompanies each volume. In addition, the data and indicators generated though this transboundary assessment are organized and presented in a common data portal linking the five individual water system databases that contain more detailed data and information. The sixth volume is the crosscutting analysis that brings together the five water components and provides a high level summary of patterns and trends. The analysis integrates the results of the five independent water category specific assessments where system risk is underpinned by the interactions among system health, human wellbeing and governance, within the constraints of a changing climate. System health is evaluated using selected directional biophysical indicators which include metrics that quantify water quantity, water quality, biodiversity for freshwater systems; and productivity, fish and fisheries, pollution and ecosystem health for Large Marine Ecosystems. For the Open Ocean, measures of Cumulative Human Impacts are used to assess waters beyond national jurisdictions, as these indicate relative risk. Socioeconomic indicators describe dependent human populations including population sizes, incidence of poverty, human development levels, and threats imposed by climate related natural disasters. Governance risks are evaluated using governance architecture, with a view to subsequently analysing governance performance, using more detailed analytical approaches. All indicators are assessed with 2000-2010 as the reference period, and several include projection scenarios to 2030, 2050 and 2100. Risk is generally lower in developed regions (Australia, North America and Europe) and higher in Sub-Saharan Africa and South and South East Asia. 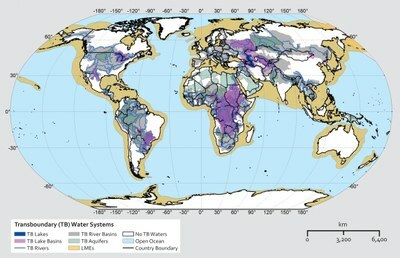 However, there are high and low risk systems in all regions, indicating the need for attention to transboundary water systems across the planet. Risk appears spread across the three thematic areas - biophysical, socioeconomic, governance - and signifies the need for governance to address the integrated nature of risk in order to effectively sustain ecosystem health and human wellbeing. There is a tendency for risk to increase ‘downstream’ from aquifers to LMEs, with the exception of transboundary governance arrangements in aquifers, which are largely absent. The assessment of governance arrangements and architecture is a novel aspect of this assessment, but does not yet reflect how effective the governance responses are in sustaining ecosystem health and human wellbeing. Subsequent assessments should focus on measuring effectiveness. TWAP has demonstrated the widespread incidence of the risk of unsustainability in transboundary aquifers, lakes, rivers, Large Marine Ecosystems and the open ocean across the planet. To reduce and reverse the causes of risk in order to meet Sustainable Development Targets by or before 2030, countries will need to continue developing and monitoring key indicators in order to identify and mitigate the sources of risk. In addition to having indicators that are specific to the transboundary water categories, it will be important to address the impacts of linkages among systems as well as the sources of risk in order to reduce risk. The approach of five separate assessments precluded a proper evaluation of the implications of the linkages between water systems in different water categories. Yet, it is well known that there are many biophysical linkages such as the flow of water itself, pollution, movement of plants and animals and influences on climate. Seeking to understand and including these linkages must be a focus of the next global assessment. Much has been learned in TWAP that can be applied to ensure a fuller suite of indicators that is focused on critical issues. As an example, the conjunctive use of surface and subsurface freshwater for food and energy production may require a nexus approach, where sustainable food and energy systems may need to be premised on the sustainability of surface aquatic systems (rivers and lakes) and subsurface aquifers, and which is constrained by a warming climate. Among saltwater systems, the downstream lateral flows of water, materials and pollutants alongside direct point sources of pollution and exploitation of marine living resources are undermining the health of coastal ecosystems. Moreover, in the open ocean as well as near the coast, climate impacts from intensifying processes of ocean warming, acidification, and deoxygenation are exerting profound influences on changes in primary and secondary production, biodiversity and carbon storage. Sea level rise will be an intensifying source of risk where cause and effect spans millennia. When anthropogenic influence alters the ability of the ocean to modulate climate and planetary survival is at risk, human behaviour towards ocean-climate interactions will require more than risk minimization. It behoves a fundamental shift in policy time frame and targets where NOW has immediate as well as millennial consequences.